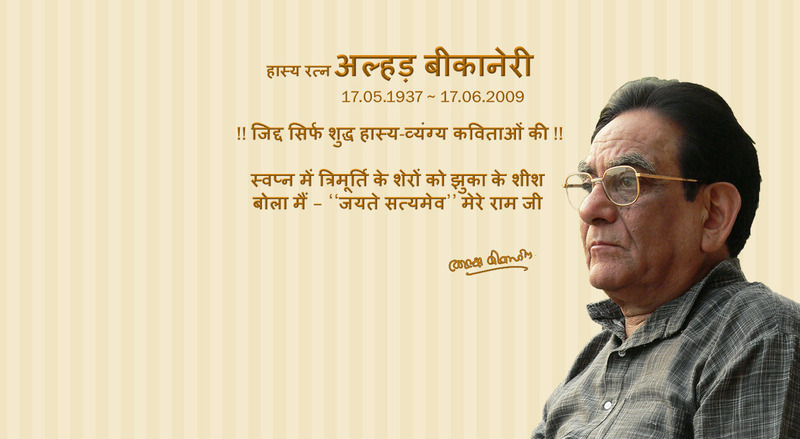 Alhar Bikaneri (Late Shri.Alhar Bikaneri) (17 May 1937 – 17 June 2009) was a renowned Hindi of Hasya Ras(Humor) of India. His original name was Shyamlal Sharma. He was born on 17 May 1937 in a small village named Bikaner, Rewari district, Haryana, India. Honored with “Hasya Ratna” he is considered as one of the most famous Hindi humour poet who used to recite poems by singing. Considered as expert of Chandd Kavita (Rydhym Poems). He was awarded & honoured with India’s some of the most prestigious Awards of Hindi humour poetry like Theetoli Award Delhi(1981), Kaka Hathrasi Award(1986), Akhil Bharteeya Nagrik Parishad(1993), Yatha-Sambhav Award Ujjain(1997), Kavya Gaurav Award Delhi(1998), Narendra- Mohan Award, Maanas Award(2000), Tepa Award Ujjain(2004), Vyangya- Shri Award(2004) & Athasaas -Shikar Award(2007).